Last Friday a picture story appeared on page three of The Age that was ostensibly about events in West Papua. The story was pitched as a quirky yarn, replete with a wacky Disney character, a kilt (always a bit funny) and some large weapons. All these elements tick boxes on the newsworthiness checklist – but, as US journalist Charles Feldman told a gathering of the Journalism Education Association of Australia in Melbourne earlier last week, “there is a difference between news and journalism”. The story was about Gerard Michael Little, who presents as a well meaning man dismayed at the death toll in Papua and who allegedly wanted to put his military and paramilitary training to good use in the form of an armed peace keeping force. He was arrested in Brisbane last week under a rarely used law that prohibits hostile activities by armed non-state actors, including planning and training. To make the charges stick, the prosecutor will have to prove that he was armed and intending to take offensive action. The story’s first appearance was on Wednesday December 5 when The Australian, ABC Local, the Sydney Morning Herald, The Herald Sun and APN’s Toowoomba Chronicle reported that Little had been arrested. The Jakarta Globe followed up the next day as news emerged from his court appearance. The articles were all accounts of the bare facts of the court case, in turn highlighting Little’s Victorian and Toowoomba connections, paramilitary training in the Ukraine, disability pension and grandfather status. Reporting a day later, The Age’s Justice Editor Dan Oakes did commendable research on the man and wrote up what he found. But what was omitted was the context. What is happening in West Papua, in general and in particular this week, goes some way towards explaining Little’s actions. Having arrived in Melbourne a day ahead of a gathering of journalism educators, I was in town for the December 1 West Papuan flag day celebrations in front of the State Library. West Papuan foreign minister in exile Jacob Rumbiak told the crowd he’d spent a decade in prison for raising a flag in Papua, and that he had many colleagues behind bars for exercising their right to peacefully express their opinion. A young Papuan activist read an open letter to Julia Gillard calling for Australia to take responsibility for the actions of the troops it is training and the atrocities they are committing on Papuan soil. 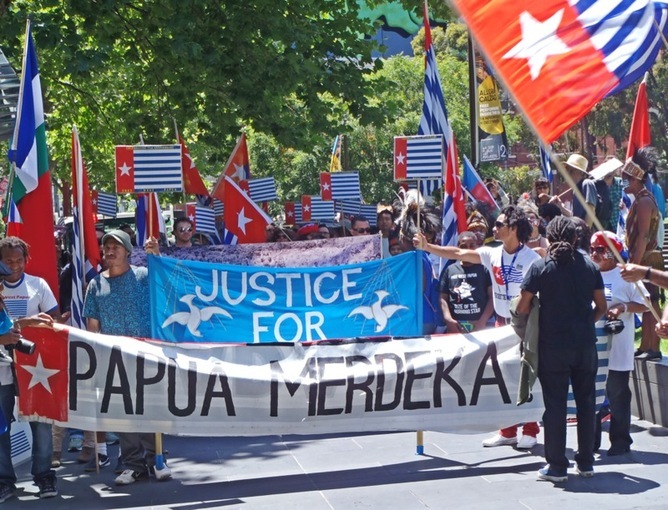 While Melbourne was sunny and bright, the cloud that passed over the gathering in its final moment at Federation Square was news that Victor Yeimo, the chairman of the West Papua National Committee (KNPB) had been arrested. His crime was to lead a peaceful protest march. 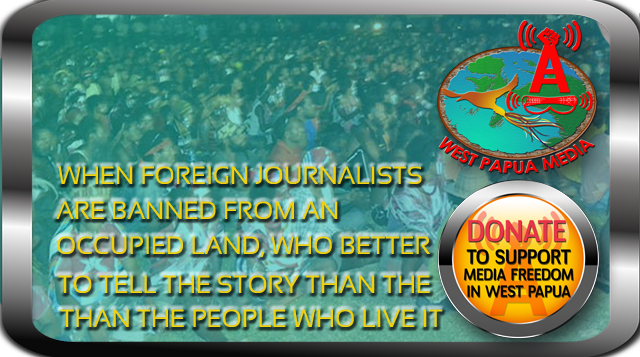 The Melbourne West Papuan community waited for news, as international human rights monitors made enquiries about Yeimo’s status and whereabouts. The next day police announced he had been released, leading to concern that he may have “disappeared”. But Yeimo surfaced, and filed a report that quoted Jayapura police captain Kiki Kurnia saying, “We are ready to wreak havoc and clash with all of you”. Yeimo called on the international community to take action. Other positive news that didn’t attract the interest of News Ltd, Fairfax or the ABC: an announcement that the Indonesian Law and Human Rights Ministry had agreed to give sentence remissions to around 20 Papuan political prisoners. This announcement must be backed by vigilant international watchdog journalism to ensure that it delivers the due judicial process it appears to promise. Tempering the optimism of this announcement was the sad news that political prisoner Timotius Napirem Ap was shot dead – in the feet, neck and back – by police. This is just one week in the rolling saga of the civil resistance movement in West Papua. It’s a story that involves villagers who live in grass huts in jungles, students who live in dorms in the urban heart of Jayapura, Australian mining executives, and the protesters who gathered in Melbourne. For them, the flurry of news attention given to Little’s arrest must seem odd. That events like these would prompt a military-trained man to step in and try to do something about the void of international neglect and media disinterest is not surprising. But he’s a symptom, not the cause, and his story is just a quirky tangent to a real story that is mostly ignored by Australia’s mainstream media. Kayt Davies does not work for, consult to, own shares in or receive funding from any company or organisation that would benefit from this article, and has no relevant affiliations.